Senlis (pop. 17,000) is a quiet historic town on the northern outskirt of Paris. It played a relatively significant role in the history of the early kingdom of France. It is famous for its Early Gothic cathedral, its well-preserved Gallo-Roman ramparts and its picturesque streets. Soon after Julius Caesar's conquest of the Gaul, the Romans founded Augustomagus ("Augustsus' Market") to become the administrative capital of the Silvancetes, a Belgic tribe. The town acquired a 4 meter deep wall in the 3rd century to defend it from barbarian incursions, which has survived to this day. Not much happened there until 987, when Hugh Capet was elected King of France in Senlis, then crowned in nearby Noyon by the archbishop of Reims, Adalberon. Hugh Capet is considered the first true King of France, as opposed to King of the Frankish kingdom of West Francia. 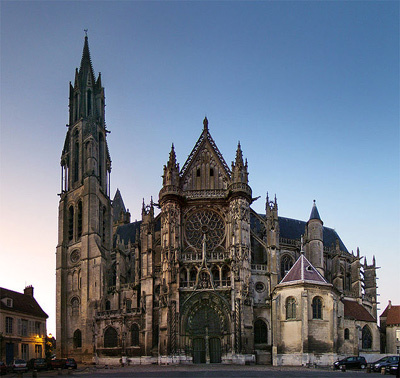 Senlis had become a royal city with a royal castle, and experienced its golden age in the 12th century, when one of the world's very first Gothic cathedral was erected there (1153-1191), and Louis VII granted Senlis its municipal charter of rights (1173). The Roman city wall rebuilt taller and expanded by King Philip II Augustus. After the 13th century, Senlis diminished in importance, neglected by the Kings of France to the profit of Compiègne or Fontainebleau. 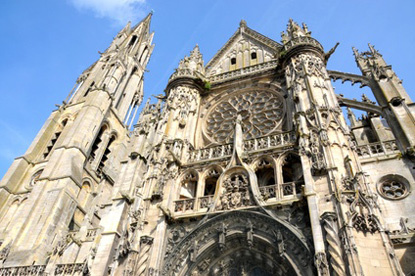 The main attraction is the Cathedral of Our Lady of Senlis, the third Gothic structure to be constructed in history, after the Abbey of St Denis (in Paris) and the Cathedral of Noyon. It is also the smallest cathedral in the North of France - only 70m in length and 23.5m under the vaulting. In 1504, the thunder struck the cathedral, causing a major fire, which forced the reconstruction of the vaulting. The adjacent episcopal palace now houses the Museum of Art and Archeology, which has an array of Gallo-Roman exhibits as well as 18th-, 19th- and 20th-century paintings. Remains of the Gallo-Roman Augustomagus can be seen in various places around town, such as a small amphitheatre, or the 7m high city wall encircling the old city (the only complete Roman city wall surviving in France). Next to the St Maurice Priory are the ruins of the Royal Castle, built against the ramparts by Louis VI the Fat (1081-1137) around 1130. Other sights include the old Church of St. Aignan (12th to 16th century), the Church of St. Frambourg (built around 1168), the Church of St, Peter (11th to 15th century), the town hall (built between 1495 and 1497), as well as several handsome 17th and 18th-century townhouses. The Parc Asterix, an amusement park on the theme of the famous French comic book, is located 10 km south of Senlis. It is the second most popular amusement park in France after Disneyland Paris. 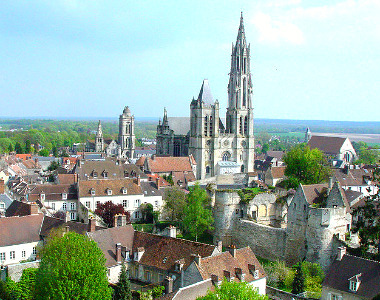 Senlis is 60km north of Paris, on the E15-E19 motorway going from Paris to Arras (E15) or Cambrai (E19). There is no train station in Senlis. However, the town can be reach by bus from Chantilly-Gouvieux station (25min), itself 35min away by train from Paris Nord station.